Accursed rings! Hammer-mad Japanese! Arms-manufacturing Baronesses! Welcome to Zelda. Somewhere in Los Angeles there’s a burglar who’s made off with more than he’s bargained for…a maharajah’s curse. Somebody stole into the Zelda Apartments in March of 1941 and there into the room of Mrs. F. S. Tintoff, making off with a 400 year-old ring that held two large stones, a ruby and an emerald, surrounded by small diamonds. “It was given to me by my husband, a jeweler, who purchased it from a maharajah. The ring formerly adorned an East India princess, and was supposed to have been given a mysterious Oriental curse which would bring death to the person who stole it,” said Mrs. Tintoff. The burglar took other jewelry which with the ring had a value of $560 ($8,196 USD2007), and two other tenants in the apartment building reported similartly burgled jewelry losses to police, but nothing thereof with a curse upon’t. The Tintoff ring thus joins other bloodstained jewels of the East, like the Dehli Purple Sapphire, the stolen-from-the-Eye-of-Sita Hope Diamond and the similarly snatched Black Orlov. And that deadly ring of Valentino. Did our housebreaker lose this cursed thing to the ages as he writhed in some forlorn torment somewhere? Were his last days exactly like this? Or perhaps the curse was purely legalistic. …which suffices only until she can fashion a thirty-nine unit brick apartment complex in 1908. She lives therein until she dies of cerebral hemorrhage in 1926; she leaves an estate valued at $300,000 ($3,521,554 USD2007). Zelda wasn’t the only wealthy woman to die in the Zelda—Baroness Rosa von Zimmerman, who with her husband the Baron were second only to Krupps when to it came to weapons manufacturing for various Teutonic scraps, lived at the Zelda and died there, an alien enemy, in 1917, leaving Rosamond Castle, on fourteen acres, across from the Huntington Hotel; eleven acres in Beverly Hills; and thirty-four acres in the Palisades near Santa Monica; and about $2.5million in mortgages, bonds and securities. Nine year-old Beatrice Denton, to whom Baroness von Zimmerman was benefactress, was supposed to be a beneficiary of the estate, but the Baroness never got around to those formalities. Foundling Beatrice became once again an orphan and was likely returned to the asylum from which she was plucked. Yes, there’s never a lack of excitement at the Zelda. Take by example the May 1916 discharge of Zelda’s porter George “an erratic Japanese” Nakamoto. Having been sacked by La Chat, and replaced by one K. Kitagawa, Nakamoto saw fit to return to the Zelda to seek out his successor. There was Kitagawa, crouched low, tacking down oilcloth in a cubbyhole beneath a stairway; Nakamoto grabbed a riveting hammer and struck him repeatedly on the head, injuring his skull, and sending him to Receiving hospital in critical condition. Postwar Zelda was full of fun too. Joseph M. Marcelino, 21, was just another ex-Marine who worked in a box factory. When he got nabbed on October 4, 1950, while burglarizing an apartment in the Gordon at 618 West 4th, he copped to having set fire to the Zelda, aflame at that very moment. He admitted as well to torching another hotel at 322 South Spring. He was freed without bail pending a psychiatric examination. But come April, when he broke into a factory at 1013 Santa Barbara Ave. and stole company checks, which he made payable to himself and cashed, the police came knocking. Marcelino had also attempted to lift a safe and had lost part of his fingernail in the process—the cops found they had the perfect match. But the winds of change blew foul in 1954. Sure, people waved their arms and preached the evils of gingerbread ornament and its relationship to tuberculosis, but when you came right down to it, The Hill impeded traffic flow. A new project, known as the 4th Street Cut, began that Summer, involving a 687-foot viaduct shooting eastward from the Harbor Freeway, carrying four lanes of one-way traffic above Figureora and Flower, then biting into the hill and passing beneath bridges at Hope and Grand before dipping down into the business district. Through the early 1950s there was much controversy over this plan—proponents of a tunnel argued that a cut would “hopelessly bisect” Bunker Hill. What they didn’t realize was that soon enough, there’d be no Bunker Hill to bisect. Seen being demo’d next to the Zelda is the Gordon at 618 West 4th (you remember, the place Marcelino was nabbed in in ’50); the Gordon, the Bronx at 624 and the La Belle at 630 West 4th were all torn down to make way for the Cut—a trio built by the sons of Dr. John C. Zahn. The 4th Street Cut opened May 1, 1956. Another shot of the viaduct (I know, why-a no chicken?) ca. 1973, during erection of Security Pacific Plaza. It has filled in now, to be fair. And so goes Zelda La Chat, her Zelda, and 4th Street, though all we have to show for the former glory of 401 South Grand is the pointy backside of 400 South Hope. W.D. Montgomery and his stepdaughter, Mary Meister, arrived in Los Angeles during October 1904. W.D. had purchased the Hotel Lincoln, at 209 South Hill, with funds provided by his wife, Laura. She soon followed the pair to Bunker Hill, and the three took charge of the day to day running of the hotel. At first everything appeared to be going well for the new owners, and they seemed to be an average hard working family. Yet beneath the surface the household was filled with discord and secrets, and it would take only a few months before everything began to unravel in a very public way. W.D. 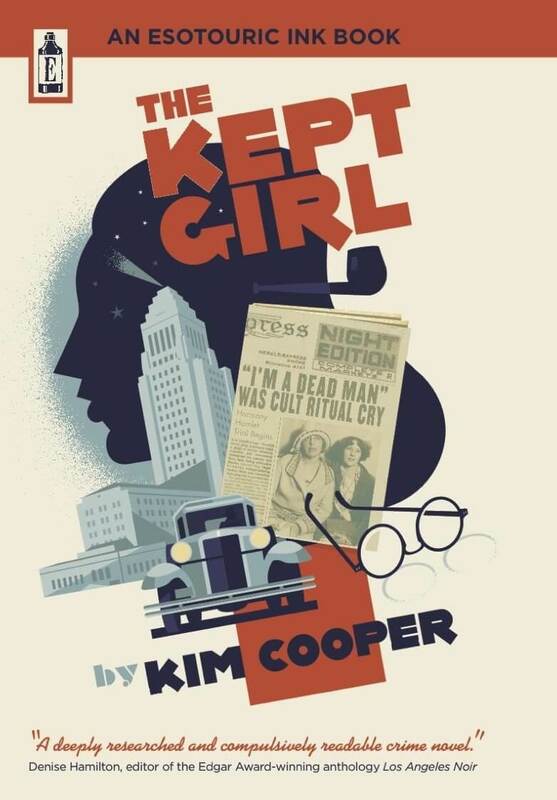 had never been a teetotaler, but once in Los Angeles he’d started drinking heavily. Maybe it was the stress of W.D.’s drinking, but Laura’s rheumatism began to flare up to the point where she became bedridden. Mary was in charge of Laura’s care, but after downing several whiskeys, neat, W.D. decided that he would take over. His bedside manner left everything to be desired. When Laura felt too unwell to eat her lunch, he told her that she would eat every morsel if he had to “cram it down her throat”. Not surprisingly, Laura’s appetite didn’t respond well to this threat, and in a fit of pique W.D. grabbed the lunch dishes and hurled them out of the window! Laura tried to persuade W.D. to attend one of Francis Murphy’s temperance meetings and take a sobriety pledge. W.D. wanted nothing to do with Francis Murphy or sobriety, and in a fit of rage at his wife’s suggestion, he smacked her. Everyone who came into contact with the couple thought that W.D. was nothing better than drunken brute, particularly when in full view of several hotel guests he chased Laura through the hotel, then grabbed her by the throat and throttled her. Although W.D.’s drinking and behavior had certainly spiraled out of control, he may have had good reason for behaving so badly. He’d become convinced that Laura was being unfaithful and had started following her. He trailed her several times to an obvious assignation in Ocean Park. Later, at home, W.D. confronted Laura and she confessed her infidelity. After 13 years of marriage, the couple divorced. By July 1905, Laura had run off with the railroad man with whom she had been having an affair. The hotel had been sold to Mrs. Belle McWilliams, and W.D. and Mary were running it while the deal was being finalized. Suddenly, Mary came forward with shocking allegations against W.D. She said that he had ruined her (early 1900s doublespeak for seduced), and that he had been going around town telling anyone who would listen that he was in love with her. One day at the corner of First and Broadway, W.D. began to shout at his stepdaughter, saying that if she turned her back on him he would kill her and then himself. It was his downtown outburst that compelled Mary to have her stepfather arrested on a charge of insanity. The two appeared in court to try to settle the unholy domestic mess. Mary broke down on the witness stand and began to sob. All eyes were on her as she turned to W.D. and said “You have ruined my reputation, and now I don’t know what to do”. W.D. Montgomery looked astonished. “I didn’t do anything of the sort” he replied, “I would marry you tomorrow”. Then W.D. went on to shock the courtroom further by saying “I thank God that the railroad man ran away with my wife”, adding, “I didn’t love her and she knew it”. By the time Mary and W.D. were finished testifying, the spectators were left wondering what exactly had been going on at the Hotel Lincoln, especially before Laura arrived to join W.D. 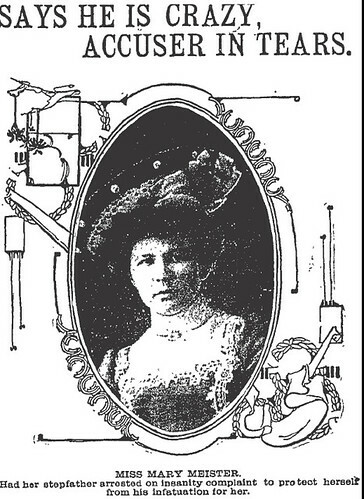 and Mary in 1904. Could they have been having a relationship then? Was that the reason Laura had become involved with the railroad man? Mary was tight lipped, but wouldn’t deny that she and W.D. had been engaged to wed! Meanwhile, W.D. continued ranting and raving in court, and finally had to be taken to the County Hospital for observation. With Mary embarrassed to be seen in public and W.D. babbling away in the County Hospital, the story may have ended there – but one more bizarre chapter remained to be written. Someone contacted police, telling them that the reason W.D. Montgomery’s behavior had been so erratic was because he had been drugged by a person (or persons) who wished to gain control of his property! The former hotel owner had been deeply in debt when he sold the Lincoln to Belle McWilliams, and it was later learned that he had borrowed against furnishings that he didn’t own. Not one single bill was paid by the Lincoln during June, even though receipts showed that $1000 had been received from patrons, and that W.D. had obtained a loan of several hundred dollars. Then, one night in early July, W.D. crept down to the safe and made a hasty $1100 withdrawal. He was discovered later in the gutter – drunk, disheveled and penniless. Shortly thereafter, bankruptcy proceedings would be instituted against him. 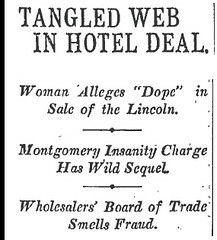 A bankruptcy hearing would be held, and the judge would hear varying accounts of the deal to purchase the Hotel Lincoln. According to Mrs. McWilliams, she’d been given a bill of sale by W.D. in the amount of $8000, but she would actually pay only $6900 for the hotel. That shady little sleight of hand was intended to defraud W.D.’s creditors to the tune of $1100. Belle told the court that she wasn’t wild about the plan, but she’d gone along with it because W.D. owed her money. Sadly, there would be no further reports of W.D.’s colorful exploits in the Los Angeles Times.